The Tri-Community Project was born in 2004, bringing into collaboration the vocation teams of the communities of Saint Benedict Monastery in Bristow, VA, Saint Gertrude Monastery in Ridgely, MD, and Emmanuel Monastery in Lutherville, MD. By combining gifts, ideas and capital, the Tri-Community Vocation Project has sought to reach a new level of visibility for monastic life in the mid-Atlantic region. One outcome was the production of this photo which was viewed by 25,000 people per day in the Washington, DC Metro System during April 2006, and which appeared in the National Catholic Reporter in 2007. 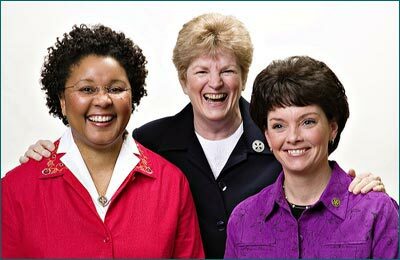 Pictured from left to right are: Sister Veronica Joyner, OSB (Bristow, VA), Sister Rosalie Desmond, OSB (Lutherville, MD), and Sister Colleen Quinlivan, OSB (Ridgely, MD). As three communities of Benedictine women we commit to deepening our monastic life in our individual monasteries and together as a tri-community entity, attending especially to sharing of resources, formation of membership and temporal affairs. Visit all our web sites.